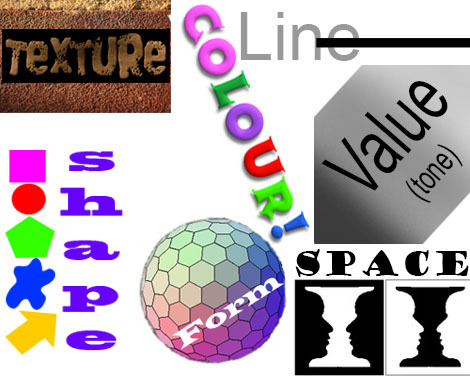 Elements of Art - the visual components of a picture. Line :: A mark which is longer than it is wide. Lines have the properties of length, width (or thickness) and vector (or direction). Shape :: A flat (two dimensional) enclosed loop with either geometric properties (angles and curves) or natural and/or organic – with no regular geometric properties. 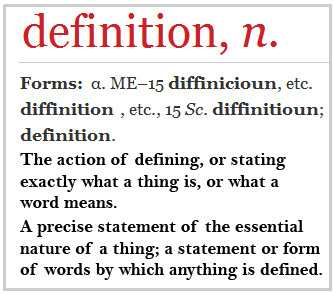 Form :: A three dimensional shape with the properties of length, width and depth. A form may be geometric with lines, curves and/or angles. Alternatively, form may be of natural or organic shape, but without regular geometric properties. Space :: The absence of objects or things around a subject in your image. However, space does have shape or form of it’s own. It is defined by the objects that it surrounds or which contain it. Value (Tone) :: In a monochrome photograph we see shades of gray. However, those tones can vary from pure black to pure white. This tonal range in art is known as value. It is the lightness or darkness in your image. Colour :: A visible wavelength of light with a Hue (colour range) you experience as shades of a colour; Saturation (colour intensity) and Value (relative lightness or darkness of a colour) of the light. Texture :: The surface quality of something. It can be seen and sometimes felt in a work of art. Designers consider the following elements in a slightly different way to artists. So, for the purposes of clarity these are explained further below. Point :: Also known as a ‘mark’. They vary in size and shape, regularity or irregularity. On the other hand, artists consider a mark or point as one of the Elements of Art – a line. It just happens to have the attributes of equal length and width. A designer may think of the use of point as part of a wider context, or distribution, of the same mark. Marks can be used to form a pattern (when grouped) or to imply lightness or darkness in an image (e.g. shading or colour brightness). Value :: To an artist, light has relative brightness or dullness – referred to as ‘Value’ in the element of art known as “Colour”. We view objects by seeing the reflected light from them. However, a designer has to express ‘Value’ through other means than actual light. So, they use pattern, density and colour to express ‘Value’ in an image they create. However, it is a facsimile of the brightness or dullness of the light (like shading for example) not the actual intensity of the light. The distinction between art and design is a real one in the literature. The difference is only mentioned here because ‘Point’ and ‘Value’ might be used by a designer slightly differently to an artist. For the photographer the distinction is not that critical. So, for the purposes of photos, it is probably best to consider ‘Value’ in the context of the Elements of Art (and not worry about design). In photography the Elements of Art can have a significant impact. Most of that impact is through the medium of composition. So, understanding the different components, or elements, helps us to grasp what it is in an image that we see effectively. Of all the elements of art, the medium of light is used to express them in photography. Everything that is visible to our eyes is seen by us as light reflected off the objects we see. In very simple terms, the elements of art are the manifestations of what we see in that reflected light. But we interpret them in the wider context of the complete scene. In many ways we have become blind to the elements of art. Not so the artist (and aware photographer). You can train yourself to see these elements throughout a scene. Become sensitive to them, exercise control over them in the way you frame your shot, or compose your picture. Of course the photographer is really composing images with light. Everything we do is seen in the camera by light, either direct from a light source or as light reflected from a surface. As a result the ‘Value’ of light is very important to us. However, we tend to refer to the value of light in terms of ‘Stops’. A stop is a relative term – we take the light level down and refer to this as stopping down. So, unlike an artist we don’t normally refer to the level of brightness or dullness in terms of the value of light. Instead, we understand that it has a value, which we can measure. In physics we refer to the intensity of light – measured in lux. In photography we measure light in terms of exposure or the number of stops. The Elements of Art tell us what goes into making up a picture. They are the building blocks, or structure, of the image we see. However, the ‘Principles of Art‘ are about how you use and combine the elements in your image. You could think of the ‘principles’ as what you do to the ‘elements’. (Note that different authors have a variety of ways to name and describe these principles. However, the core ideas are essentially the same). Damon is a writer-photographer and editor of this site. He has also run a major website, a computing department and a digital image library. He started out as a trained teacher and now runs training for digital photographers.